To receive your limited-edition tags, we just need the mailing address to which you’d like the tags sent. Simply click the link below, provide the address* by Friday, December 18 at Noon Eastern Standard Time and we’ll mail your gift to you. 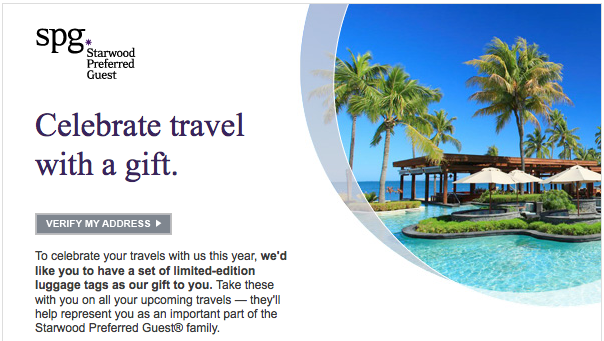 There’s a link in the email (or click on the picture below) directing you to a web form which will validate if you are a SPG Platinum member. Once you are confirmed as a SPG Platinum member, you will have to provide your mailing address to receive these limited-edition travel tags. As stated in the email, you will need to complete the form by no later than noon Easter time (this Friday), December 18, 2009.